Because pocket doors are built into the wall, they are a great way to save space and they’re not much harder to install than a regular door. 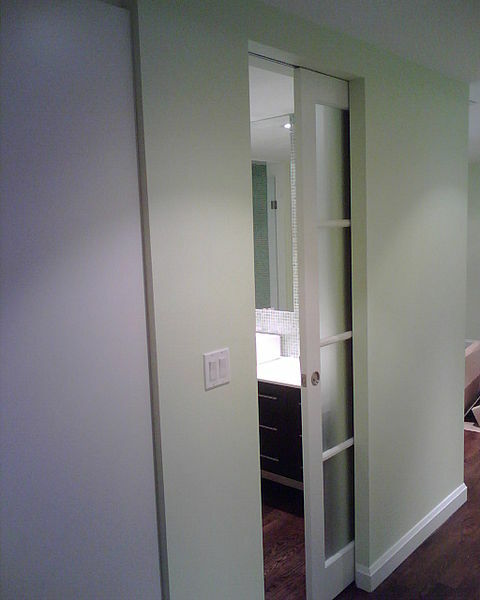 In this how-to, our door installation experts briefly describe how to go about hanging your own pocket door. Check to see if you have enough room in your wall for a pocket door – you’ll need a rough opening that’s twice the width of the door. If you’re installing a new header, the height should be at the length of the door plus 31 ¼ inches, plus the height of the soleplate (if any). Install a new stud across from the existing stud on the opposite side, then install your header. Cut and fit your soleplate to the floor. Map out and plan your new framing. Check the sides of the frame for plumb. Cut the door tracking to fit the length of your new door. Mount the track in the rough opening by screwing the brackets into the studs. Tip and split the studs into the floor brackets and attach the tops of the studs to the header using nails. Install the pocket door hardware – mount hangers to the top of your door and then slide the wheels into the track. Hook the hangers onto the carriages, then hang your new door. Check to make sure that the door is level, then lock in the latches or pulls. Secure your drywall to the framing using screws, then apply drywall tape and thin coats of compound over the seams. Let dry, sand down, and paint.